With a team-best record of 9-6, freshman star Vazha Shubladze has been a standout on this year’s men’s tennis team. 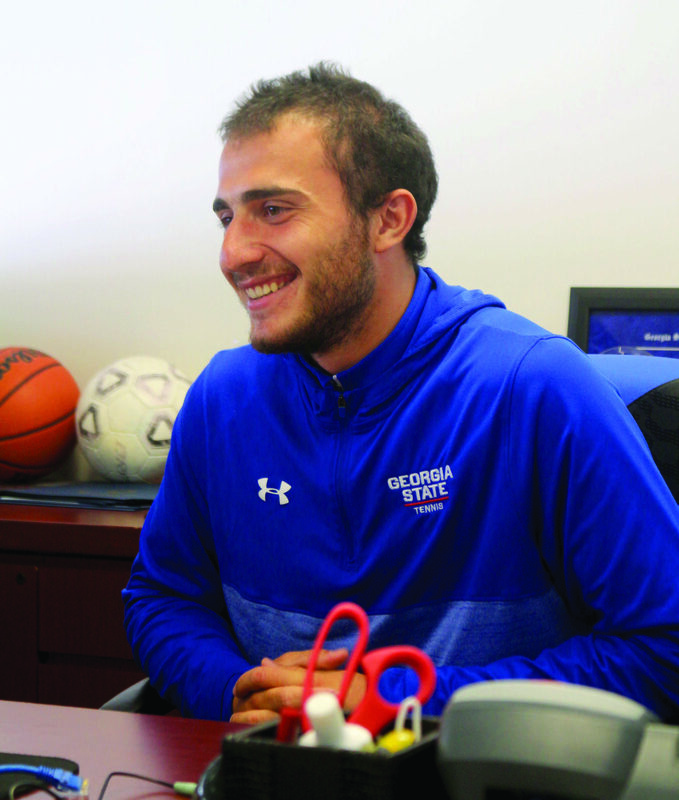 Hailing from Georgia – the country, not the peach state – his story is the kind that makes us all proud to be Georgia State Panthers. Maybe you are unfamiliar with his home country. Geographically speaking, it is an eastern European nation located on the Black Sea, sharing borders with Russia, Turkey, Armenia and Azerbaijan. Situated in a vital crossroads between Europe and the Middle East, it is a world away from Shubladze’s new home in Atlanta. Culturally speaking, it is a former Soviet republic with an ancient history, a proud people and as Vazha describes, great food. Currently in his freshman year, Shubladze arrived in January. His parents, Zamiri Shubladze and Maka Simchikori, watched as their lone child travelled over 6,000 miles to continue his tennis career and further his education. The reality was not easy at first. For Shubladze, tennis has always been an important part of his life. He credits much of his success to his parents and their willingness to let him follow his dreams. Head coach Jonathan Wolff was quick to praise his freshman star. With a number of stellar victories against tough players this season, including three-set wins over a nationally-ranked opponent from Georgia Tech and a conference rival from Texas Arlington, Shubladze made his mark immediately on the team. Today, Shubladze needs the support of crutches to walk, as a result of a recent torn meniscus injury picked up against Troy in March. His outlook, however, continues to remain positive. He’ll undergo surgery, and, depending whether it’s a partial tear or complete tear, the recovery time could be anywhere from six weeks to six months. But there is much more to Shubladze than his tennis swing. The man has a bright personality with a smile that can capture the room. He is proud to talk about his life story, making sure to include a joke or two for good measure. “He is always in a friendly mood,” Wolff said. And like so many of us, Shubladze is a big fan of food, all things Game of Thrones and basketball. “I will have a lot of time to watch Game of Thrones since I do not practice anymore,” Shubladze said.